UNG HR Compensation is now using HR ClassifyNow within the UNG ServiceNow web application to review, process, and track compensation requests including new classifications, reclassifications, job description updates, and salary/equity reviews. This new process replaces the emailing of position descriptions via email, as we are asking for you to submit the information in the new ServiceNow format. Please log onto the ServiceNow website using your UNG username and password. The below screenshot depicts the path to the Job Classification Request application. A department user can submit a new compensation request to UNG HR Compensation for review. This can be used for new classifications, reclassifications, job description updates, and salary/equity adjustment requests. Please see following tabs for screen shots and directions. 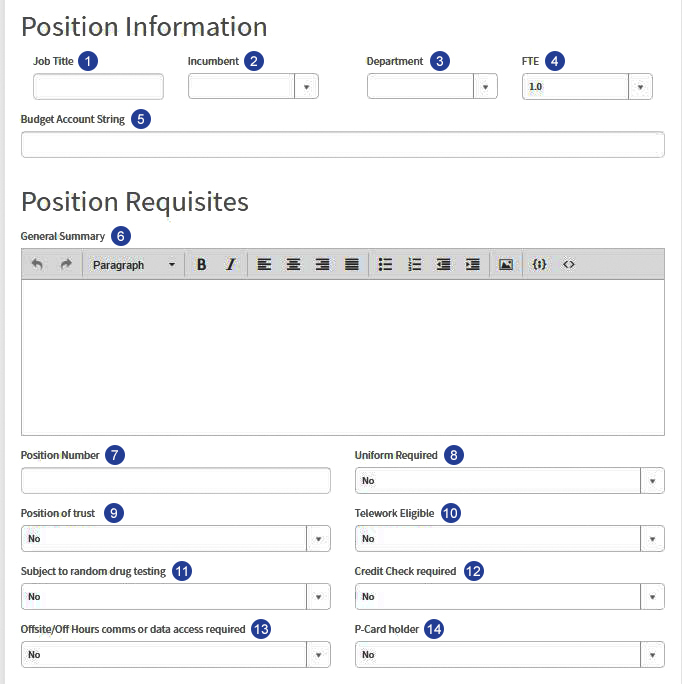 It may be helpful to use a current position description to fill in the required fields in ClassifyNow. At any step in the process, if you have questions, please contact either Cheri Wray (678-717-2282 or cheri.wray@ung.edu) or Amy Collins (678-717-2253 or amy.collins@ung.edu). Please enter a Job Title that you believe is appropriate (or already established). Please note, however, the title is subject to approval by Human Resources, based on the job duties, scope and relationship to other campus and industry roles. Incumbent: Please enter incumbent’s name if the request is a reclassification request or enter the previous incumbent’s name for a new classification request. NOTE: Please begin by typing the individual’s first name, followed by last name. If there is no current or former incumbent, please leave blank. Department: Start by typing the name of the associated department, then select the most appropriate option. This would be in line with the funding source of the position. 1.0 FTE is a 40-hour (full time) position. A person who works 30 hours per week = FTE of .75, which represents 75% of a 40 hour week). Budget Account String: A REQUIRED FIELD FROM THE DEPARTMENT. Please be sure to put the account string (Fund _ Department_ Program_ Class. In the case of grant funding, please also put the Project or grant number at the end). General Summary: Please enter a general summary for the job overview. Summary should not be a task list and should only be 4-6 sentences long. Specific tasks should be captured in the Duties and Responsibilities section with an appropriate percentage of time allotted. For the following boxes, please mark all that apply. Please leave blank any fields that are “no.” After review, Compensation and HR personnel may amend fields if applicable. Uniform Required is limited to UNG positions that truly require specific UNG attire in performing the job. Human Resources verifies this. Pos of Trust (Position of Trust): any position that has broad (including “after-hours” access) to UNG buildings, vehicles, security, property, money or financial responsibilities, minors, etc. All employees must submit to a background check. Telework Eligible: limited to certain positions that reasonably meet the criteria set forth in UNG policy on teleworking. Subject to Random Drug Testing: currently applies to limited positions at UNG. Credit Check Required is also a field that is verified by Human Resources personnel. This is typically for executive and upper administration positions, but also for positions that have exposure to money, P-cards, budgets, certain UNG properties, such as vehicle access, responsibilities for valuable items, etc. New or existing employees who are selected to move into a position that requires a credit check are subject to a review by a USG authorized vendor. Satisfactory results in the background and credit checks must be shown for the candidate to officially move into the position. Offsite/Off Hours comms and /or data access required: Box is checked if the position requires use of a UNG subsidized cell phone, as determined by Human Resources in conjunction with the hiring department and established UNG guidelines or policies. P-card Holder: Please mark this field if the position requires the incumbent to hold a UNG purchasing card. Any P-card holder is automatically subject to a credit check. 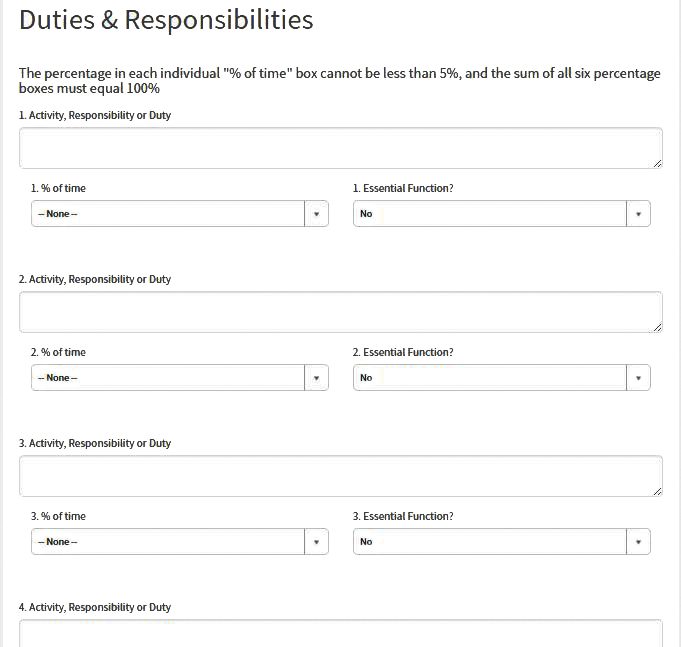 There are six fields in the Duties & Responsibilities section to be completed at most. Percentage of time for the completed fields must equal 100%. In this section, please enter the job specifications required to perform the job. This description is related to the position rather than any individual that may hold the position. 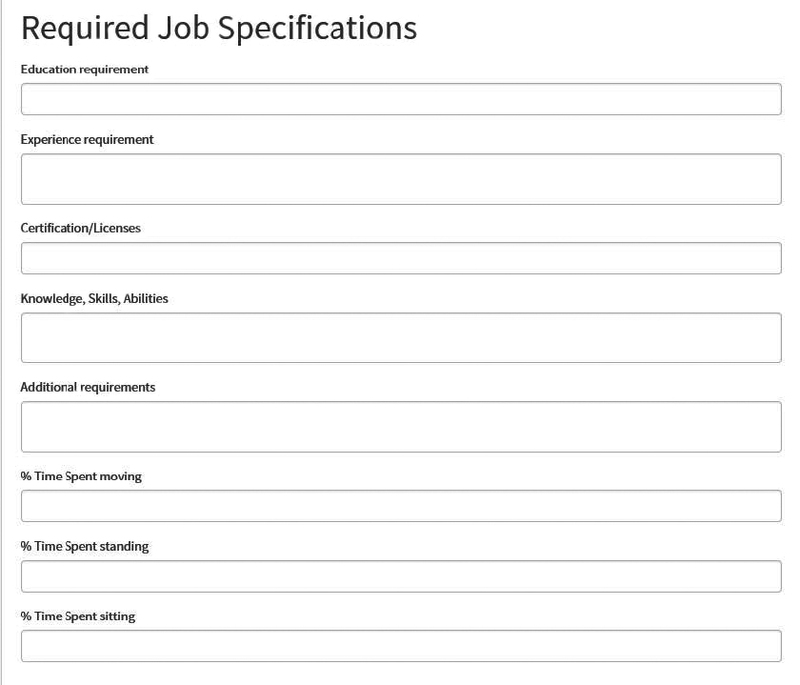 Please list any physical requirements in the Additional Requirements box in the Required Job Specifications section. The assigned Compensation Analyst will review the stated requirements against best practices and market data to ensure the requirements are fair and equitable. In this Required Job Specifications section, please enter the job specifications required to perform the job. Please do not relate these requirements to any particular incumbent. This will also be reviewed during the classification process and will ultimately be matched to best practices and related benchmarking indications for education and experience requirements. Minimum requirements may be amended by the HR review process when applicable. Please list any physical requirements in the Additional Requirements section. Please enter the supervisor title (rather than the supervisor’s name) of the immediate supervisor in this section. For Extent of supervision received, please select the most appropriate choice from the drop-down. If the position requires the person to perform any budgetary responsibilities, please list them here. If the position performs no budget work, please leave blank, or put N/A. For FTE’s (full time equivalent) supervised, this should include only UNG employees (not students). For Home Campus Location, please select the one where the most time is spent if the position visits multiple campuses. At the end of the form is a check box that you must complete, confirming that the duties, education, experience, and all aspects of the submission are complete and accurate for the proposed description. At the bottom right hand corner is an option to use of you want to include attachments. This might possibly take the form of office memos related to the decision to post a position, or permission to review and post a position from the area VP or any other supporting documents related to the submission. Ultimately, the objective is to provide an accurate portrayal of the position, and not any one individual who does occupy or has occupied, or might occupy the position. The final version of the document should also be consistent with best practice, benchmark sources, and institutional and industry standards for similar positions. Once the review is completed by classification and compensation personnel, the final resulting description will be shared with appropriate personnel related to the position. If there is agreement, the position can then be processed in the appropriate manner for the situation.